There are two types of degrees when it comes to oral or written communication—comparative and superlative. When using the comparative degree (for doing comparisons), we know that it is necessary to use “than” in the same sentence. However, when we use words like “higher,” “taller,” etc., we need not use “than” in the certain sentences. It is necessary to use “than” only when we use the words “more” or “less” in the same sentence (e.g., “less common than”, “more difficult than,” etc.). 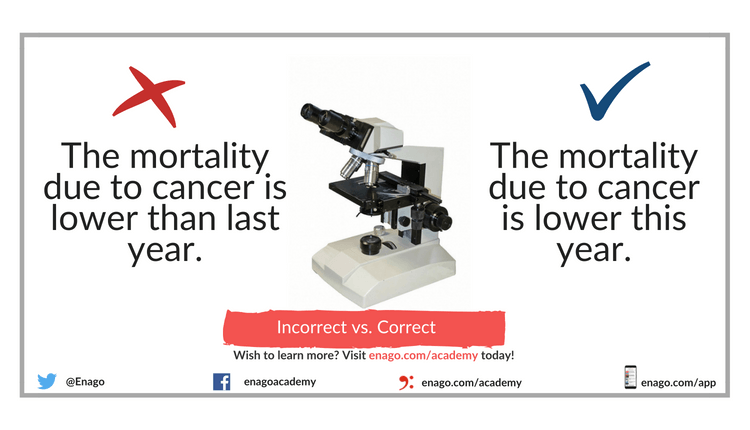 Incorrect: The mortality due to cancer is lower than last year. Correct: The mortality due to cancer is lower this year. Correct: This experiment is more difficult than the previous one.